According to their logo, JazzSports has been online since 1996. They started off well enough, earning a B rating from the leading watchdog sites back in 2003. They remained in good standing for a couple of years until they were dropped to a C in 2010 and D in 2011. There is very little about them after September, 2011. I want to take a couple of minutes now to show you why you should avoid them in 2013. JazzSports is located in San Jose, Costa Rica. They’re part of the DPT Group, which is supposedly one of the largest online/land betting companies in the world. They are affiliated with other books such as ABC Islands and Looselines, both of which have poor ratings. They claim to accept all players, regardless if you’re from the US, a recreational bettor or pro. They also claim to be the most trusted name in gaming. Yeah, riiight…. Starting in June, 2010, a couple of players complained about Jazz being late in paying them. At that point a combined total of $9,000 was owed. At this time their rating was lowered. The very next day that amount increased to $11,500, as now a third player complained about not receiving his money. By this time Jazz apparently discontinued their live chat service, too. Nothing was mentioned about why, but if I had to guess it was to avoid players reaching out to them, wondering where their money was. Towards the end of 2010 a player put in a request for a $5,000 withdrawal via bank wire. He stated that he chose a bank wire over Moneybookers because he overheard JazzSports claiming that they were waiting on funds to hit their Moneybookers account. Then a couple of weeks later a player reported that he maintained a $16,000 balance on the site. While he did receive a payout for $1,000, he had not heard a word on his next payout, which he recently requested. Now fast forward about 9 months. SBR reports that a customer emailed them (SBR) to share his experience chatting with a rep at Jazz. During this chat he followed up on the status of his withdrawal. The customer service rep told him that due to vendor issues, no money could be withdrawn until the start of football season in September (2011). At that point SBR was reporting that players were owed more than $200,000 – one player was owed $100,000. Another player reported not receiving a payout for more than 6 months. And that’s where the reports ended for JazzSports. Although I find the rep’s answer (shockingly) honest, at the same, could you imagine how the player felt? To be told that the sportsbook has no more funds until players started to deposit again at the start of football season? If there was a sign to never deposit at that sportsbook again, that was it. There’s nothing special about these scams. It’s just blatant theft. JazzSports chose not to keep enough funds on hand to honor withdrawals. They funneled player deposits to the higher ups. In fact, based on my research, they didn’t even pay their employees. They lost more than 40 employees over the course of a year, as a result. It may have also had to do with the fact that JazzSports frequently changed business names to avoid paying out the mandatory social insurance, too. Knowing that, you have to ask yourself – if they don’t pay their employees, how can you expect them to pay you? I can’t stress enough how important it is to do your research. Fancy websites, bonuses, offers and shills don’t mean squat when you can’t withdraw your winnings. Just take a look at low vig book 5Dimes. They have the ugliest site of any sportsbook, poker room or casino that I’ve come across. It could even be the ugliest site on the interwebs. But that doesn’t matter. You know why? Instead of looking at fancy banners and websites, do your own research. Find out who operates the sportsbook you’re considering signing up to, and whether or not they’re legit. Then follow up with your friends and peers before whipping out your credit card. A little bit of work up front will save you a lot of stress and headache down the line. Are these Crooks Still Around? Unfortunately, yes. They still operate a sportsbook, casino, live betting and casino, and racebook. You’ll also notice that they’re still somewhat active on Facebook. Something tells me that their fans must not be aware of the sham that JazzSports is. Do they have Sister Sites? Not JazzSports. There are several sites operating under their parent company umbrella though, including Looselines and ABC Islands. All of these sites are poorly rated and we strongly recommend steering well clear of them. 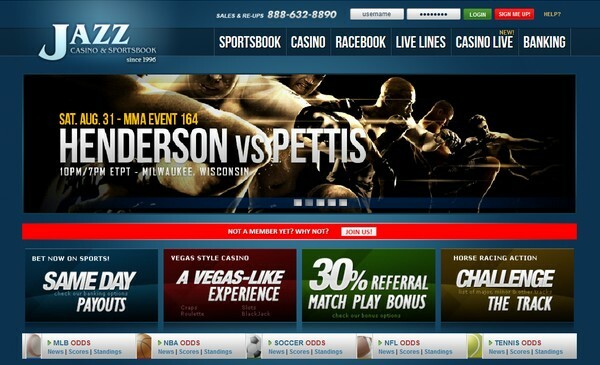 SBR’s JazzSports page – View their ratings, scams and other news.